Attendance statistics for accident and emergency departments provide an indication of both accidental and deliberate harm affecting young people and the magnitude of particular risk factors. Table 8.8 shows overall numbers by gender and category for Devon, highlight there were over 65,000 attendances for persons aged 0 to 19 in 2013-14. 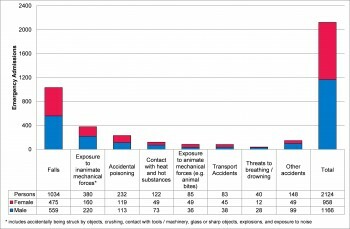 The pattern varies markedly by gender, with males much more likely to attend as a result of assault, a sports injury, and to a lesser extent a road traffic accident. Females are more likely to attend as a result of self-harm. 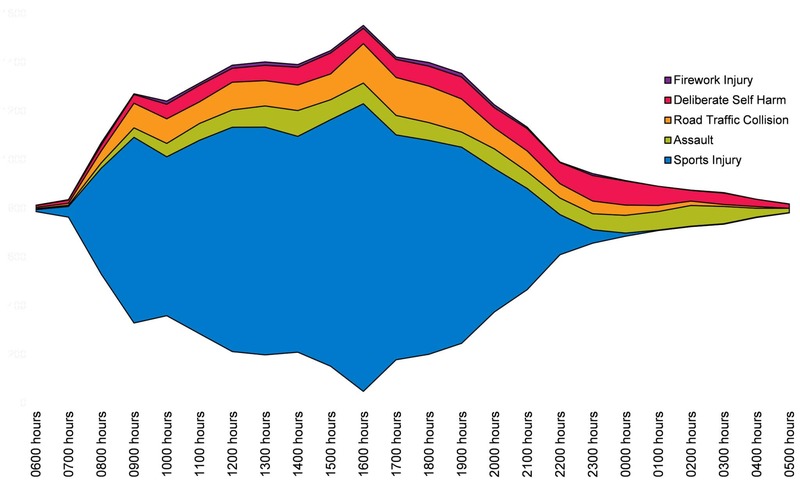 Figure 8.6 displays the pattern by time of attendances by time of day for selected patient groups for 2011-12 to 2013-14. This highlights attendances due to sports injury are highest during the daytime peaking at 4pm. Road traffic collision attendances peak in the late afternoon. Attendance rates for deliberate self-harm increase through the day and peak between 11pm and 1am. Attendance rates for assault are highest from 12 noon to 4pm and peak again in the early hours. 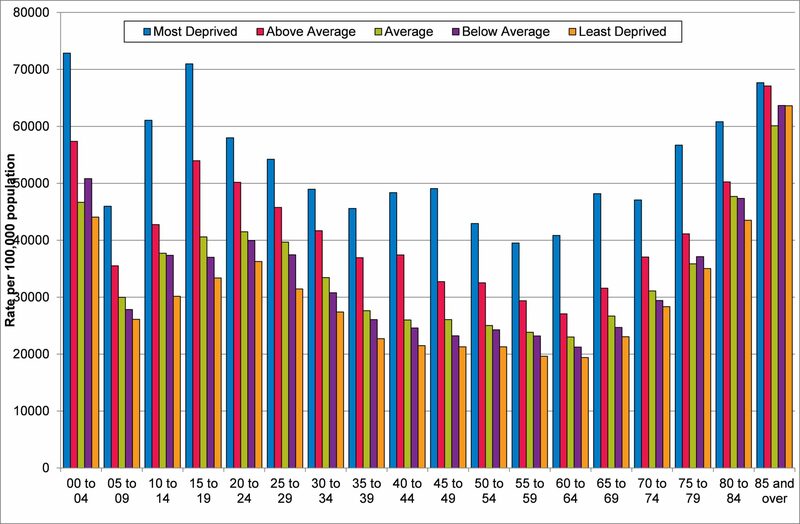 The figure below shows age-specific attendance rates for Devon by deprivation, highlighting attendances are particularly frequent for children, with the peak ages being 0 to 4, and 15 to 19. Attendances are also more likely in more deprived areas at all ages, highlighting the impacts of both social deprivation and age on attendance rates. Unintentional injury is the leading cause of death amongst young people aged one to 14 years and causes more children to be admitted to hospital each year than any other reason. The Preventing Unintentional Injuries to Children and Young People in Devon Strategy highlighted some important issues and challenges (http://www.devonhealthandwellbeing.org.uk/health-and-wellbeing/lifestyles/unintentional-injuries/). 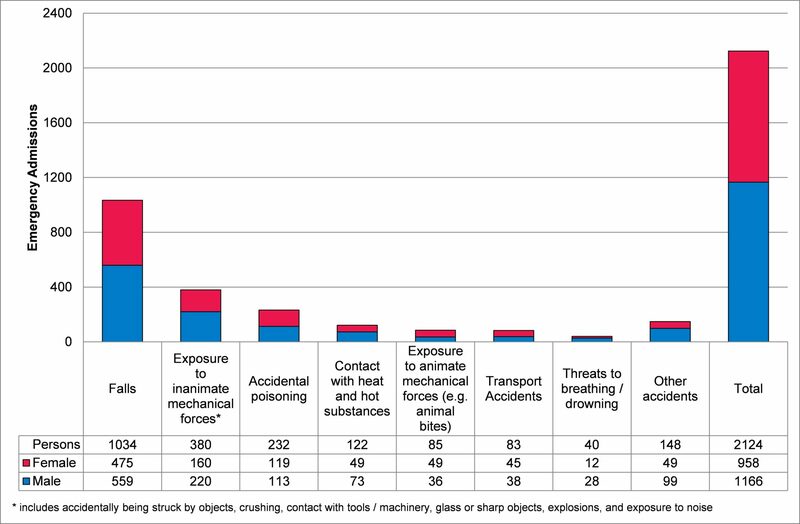 More up-to-date figures on emergency admissions from accidental causes for under-fives are included below. This highlights falls, exposure to inanimate objects and accidental poisoning are the leading causes of accidental injury.